The signs of impending doom were there, we just didn’t look hard enough. Or we put too much faith in the established order. Or we didn’t dare believe it might be so (depending on where our loyalties lie). Hawthorn had been hanging on by its fingernails for quite some time and, bit by bit, their resistance was fading. So much of modern football is measurable by numbers, some relatively complex and requiring informed analysis, others straightforward. In the case of the Hawks, the latter will do. For starters, they’ve now lost eight of their last ten games: prior to this season’s implosion, they’d won two of their last six in 2016. One of those, a must-win affair against lowly Collingwood, was snatched from the fire by Jack Fitzpatrick’s memorable late goal at the MCG. That heart-stopper was the sixth thriller the Hawks had negotiated for the season. Five were won by a kick and there was a nine-point win over North Melbourne in mid-year. We, of course, all nodded sagely and muttered to the effect that it showed how much belief this mighty team had. It would all be okay on the night. Or day, or whenever the grand final was scheduled. How hypnotised we become by sustained success. As you look back now, Hawthorn was clearly a fading entity. If the three consecutive one-kick wins in the first five weeks had gone the other way, they were 1-5 by Round 6. And before you say, “But they didn’t”, the fact is the Hawks were by now playing close to the cliff’s edge. Their phase of stability last year was a nine-win sequence from late-May until the end of July. But, with the benefit of hindsight, even that was a mirage. Only two of the nine teams they beat through that period made the finals – edging North Melbourne by nine points as mentioned above, and downing Sydney at the SCG by five points. Perhaps the latter was the Hawks’ finest two hours of the season but maybe, just maybe, it was achieved against a team also struggling with the pull of gravity. The other wins were all against bottom-half teams. So, the writing was on the wall. Not that it warned of so spectacularly disastrous a start to the 2017 season as we’ve seen. 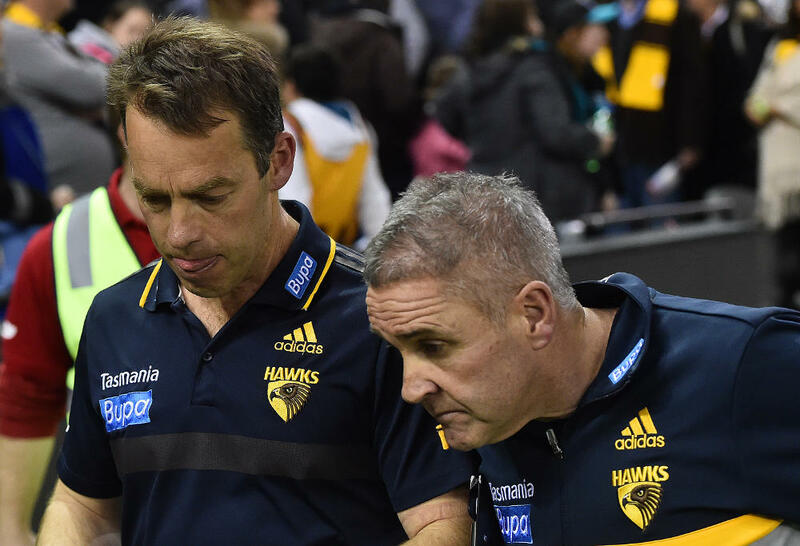 However, having slipped from last year’s top four by the end, having parted ways with two of its greatest players of the era, and with the clock ticking audibly on some others, the Hawks were hardly likely to go forward. They could reasonably be expected to be a lower-end-of-the-eight prospect at best. And that’s based purely on the cold, hard numbers. But there’s more. When eras end and great teams begin the inevitable slide, another factor inevitably comes into play. This is, thank goodness, where the game’s humanity still asserts itself. And that, it’s fair to say, is what we’re now seeing. 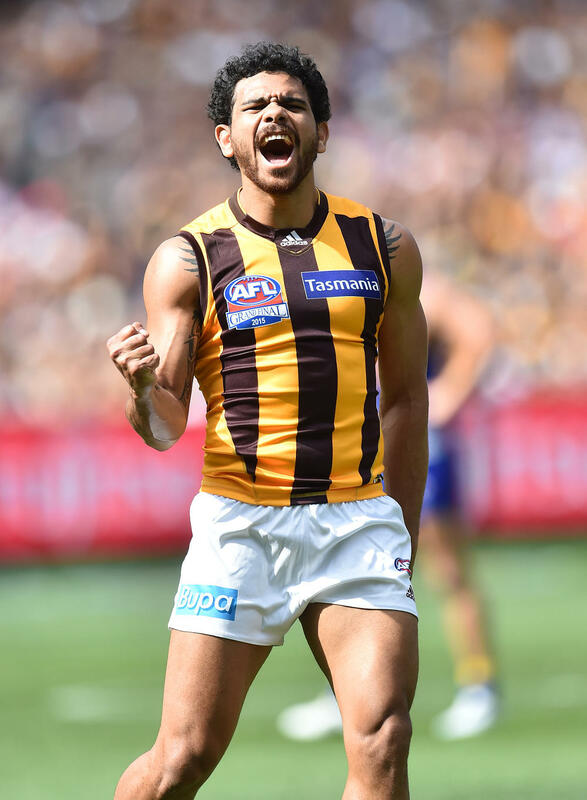 Suddenly, Cyril Rioli (most obviously), Luke Breust, Jack Gunston, Liam Shiels, Josh Gibson and a few others are playing without killer instinct, for they know their team is no longer a killer. As that knowledge has penetrated their collective psyche, the glorious confidence of the past five seasons has eroded. And the players promoted to fill gaps in the team haven’t found themselves surrounded by a supremely confident group, as had happened in recent years. Indeed, theirs is the polar opposite experience. I was foolish enough to imagine a rebound from the Round 3 humiliation on the Gold Coast. 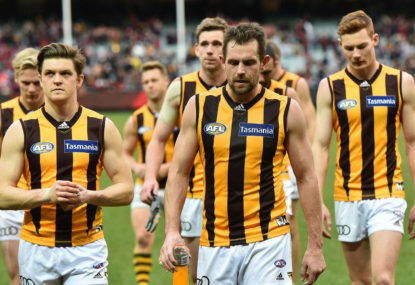 Instead, through the early stages on Easter Monday, the tentative team wearing brown and gold was unrecognisable as Hawthorn. Fortunately for the Hawks, Geelong seemed to be jumping at shadows. Until late in the day, the Cats played as though dealing with a ticking time-bomb. Once they realised their opponent carried no weapons, however, they beat Hawthorn as no one has done in years. So, where to now? It’s no longer a matter of whether the Hawks can make the finals; more of how low they can go. Currently, they’re dead last. Surely not? This, as we know, is what can happen to a team that’s enjoyed sustained success. The question is: how to rebuild quickly? And who should lead the new era? Alastair Clarkson acted with breathtaking boldness in farewelling Sam Mitchell and Jordan Lewis. He might well be asking himself now whether, despite his long-term contract, he should join them. Former club president Jeff Kennett thinks so. Clarkson could make a fresh start elsewhere – there’ll be no shortage of suitors. On the other hand, Hawthorn plucked him from relative obscurity and gave him a start. Also, having made such a radical move on two of the club’s greatest champions to begin the rebuild, it could be argued Clarkson now has an obligation to dig in for the long haul. It’s been a brown-and-golden era. For nearly a decade now, the Hawks have been armour-plated as they’ve controlled the traffic around them. Suddenly, they’re very exposed as they stand at the crossroads. Tim Lane is one of the most respected voices in Australian sport, having gained a strong following for his weekly AFL column in The Age. Tim has also called 32 AFL/VFL grand finals and was behind the microphone for Cathy Freeman's memorable gold medal at the Sydney Olympics.